Experience the amazing Colorado River by bike, a unique hybrid water experience.This guided half-day tour will take you on a 5.5 mile journey on the Colorado River starting from Willow Beach Arizona and includes many beautiful stops like the historical short hike to the top of the river, Gaugers Home site, Emerald Cave and much more . Enjoy wildlife viewing, swimming, geology and history with your guide. Round-trip transportation available from the Las Vegas Strip. Alternate meeting location is the Hoover Dam Lodge Boulder City NV. All your necessary equipment, guide, cold bottled water and a delicious lunch with lots of snacks is included. 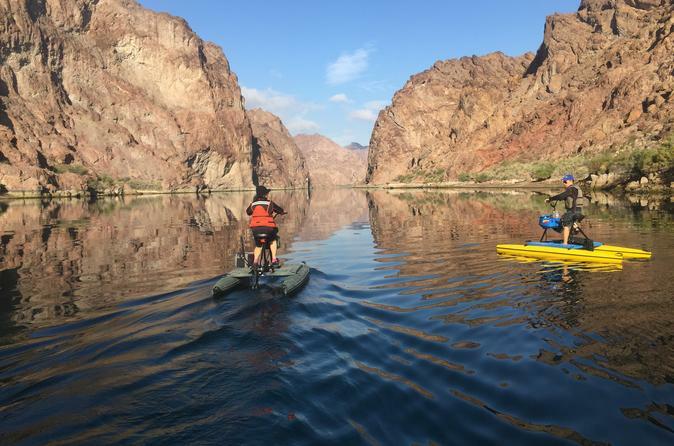 Your hydrobike experience begins pickup from your Las Vegas area hotel and a short drive to the launch site on the Colorado River at Willow Beach. After a 15-minute safety and training session from a certified CPR-trained guide you'll start with a 2-mile ride by hydrobike on the Colorado River to a beautiful overlook at the River Gauger's Historical Homesite. Here you'll take a small break for photos, enjoy snacks and lookout for wildlife such as Big Horn Sheep, Bald Eagles and other waterfowl. Next you'll continue for 1-mile to Emerald Cave, a beautiful clear water hidden cove where you can swim and cliff jump. After a fresh lunch served on a rocky beach along the Colorado River you'll peddle for 3-miles back to Willow Beach where your tour will concluded with transportation back to Las Vegas.